The ClotCare International Registry of Interactions Between Oral Anticoagulants and Dietary Supplements is now available online. At this time, anticoagulation clinicians are invited to begin using the registry to report observed interactions between warfarin and dietary or herbal supplements. The system will ask the reporting clinician to check responses to several questions in order to grade the strength of the data being reported. Development is currently underway to make this registry searchable so that cases reported may be reviewed by others. More information about this registry is provided below and questions or comments may be submitted to Marie Walker at webmaster@clotcare.com. The registry is currently offline for maintenance. The use of dietary supplements, including vitamins, minerals, amino acids and herbal medicinals (botanicals), has risen dramatically in the last decade. Unlike legend drug products, dietary supplements are not tested prior to marketing for safety, efficacy, dosing requirements, or drug interactions. In addition, these products are not regulated with respect to labeling or tablet contents. For these reasons, little is known about the risk of using these products in patients taking warfarin or other oral anticoagulants. At least 3 published medical papers (including one by us) have called for a national herbal registry to gather information about the interactions between warfarin and herbal products1, 2, 3. The aim of this registry is to obtain case-based evidence of drug interactions between oral anticoagulants and dietary supplements. Interactions that occur in stable anticoagulated patients will be defined by monitoring and clinical outcomes, and by likelihood using a modification of the Naranjo Adverse Drug Reaction Probability Scale. These data can be used as a guide for clinicians regarding the safety of certain products in patients taking oral anticoagulants, and as a tool for researchers to develop clinical trials in order to further evaluate the risks associated with the concomitant use of oral anticoagulants and certain dietary supplements. Anticoagulation specialists who manage oral anticoagulation through organized management services (anticoagulation clinics) are invited to submit reports of drug interactions through ClotCare's Web-based reporting system. 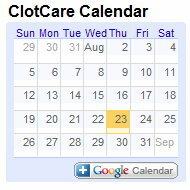 This registry is Web-based and accessible through ClotCare. This Registry will not collect data regarding anticoagulation patients exposed to dietary supplements who do not experience drug interactions. Accuracy of the data obtained by the Registry is dependent on the interpretation of events by the reporter and cannot be verified independently. Drug interaction reporting cannot control for differences in product ingredients or tablet contents of dietary supplements. Bussey HI, Tapson V, Cannon RO, et. al. Opinions and research priorities. Thromb Res. 2005;117(1-2):155-69; discussion 170-4. Epub 2005 Aug 15. Shaw D, Leon C, Kolev S, Murray V. Traditional remedies and food supplements. A 5-year toxicological study (1991-1995). Drug Saf. 1997 Nov;17(5):342-56. Wittkowsky AK, Bussey HI, Walker MB, Frei CR. Dietary supplement use among anticoagulation clinic patients. J Thromb Haemost. 2007 Apr;5(4):875-7. Epub 2007 Jan 9. ClotCare would like to thank the Management Information Systems program of the Red McCombs School of Business at the University of Texas at Austin. A wonderful student team from the MIS program's capstone course who worked with us to develop this registry were invaluable to the project.